Peterborough United manager Graham Westley was thrilled by an outstanding team performance as Darren Ferguson’s Doncaster Rovers were hammered 4-0 in a League One fixture at the ABAX Stadium today (October 24). Posh are now the top scorers in League One with 30 goals from 15 matches after goals from Gaby Zakuani, Erhun Oztumer, Callum Elder and Conor Washington ruined Ferguson’s return to the club. Posh midfielder Erhun Oztumer celebrates his superbly-taken goal against Doncaster. Photo: Joe Dent/theposh.com. Oztumer claimed the man-of-the-match honours, but Westley declined to talk about individuals. 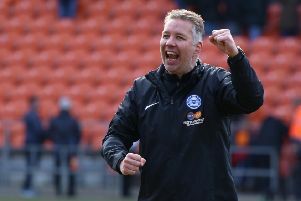 He insisted that every player who ventured onto the field in a blue shirt deserved credit for a win that has lifted Posh four places into ninth. “We want teams to feel attacked, not just by our forward play, but by our defensive play,” Westley stated. “When we’re not scoring enough goals don’t just blame the strikers and if we are lacking ruthlessness at the back don’t just blame the defence. “We are a team and we looked like a very good one today. I want us to improve game by game, week by week and this was very much a step in the right direction. “We were a team with the ambition and desire to create chances, the ambition and desire to score goals and with the ambition and desire to keep a clean sheet. We worked hard on our defensive play after the (3-2) defeat by Wigan so it was great that all that work led to a clean sheet. “There were obviously some very good individual displays, but I don’t think any individual deserved the limelight today. We were simply very good as a team. “We were excellent going forward in the first-half and then we consolidated in the second half. “I enjoy watching players making tackles, winning headers and tracking runners and I enjoy watching players score goals. There was a lot of enjoyment in our performance today. “We could have scored 10 goals today. Zakuani suffered a muscle injury early in the game today. He was substituted, but it’s expected that he will be fit for the League One trip to fourth-placed Coventry on Saturday (October 31).